SACRAMENTO, Calif. -- It's rare for a professional tennis player to have a college degree. John-Patrick Smith and Bradley Klahn, who met today in the first round of the $100,000 Sacramento Pro Circuit Challenger, have three bachelor's degrees combined. Smith, a 25-year-old Australian, earned diplomas in economics and business administration from the University of Tennessee in 2011. Klahn, 24, from Poway in the San Diego area, picked up an economics degree from Stanford the following year. "I like school, and obviously I have a very keen interest in business," Smith, whose parents are both teachers, said after leading a parade of upsets with a 6-2, 2-6, 6-3 victory over the third-seeded Klahn at the Natomas Racquet Club. "After tennis, I look to do something in that." "I don't know what I'm going to do next week," Smith cracked, "so I wouldn't know what I'm going to do after tennis." Also ousted today were No. 4 Michael Russell of Houston, No. 6 Peter Polansky of Canada, No. 7 Thiemo de Bakker of the Netherlands and No. 8 Frank Dancevic of Canada. Russell, 36, and de Bakker retired from their matches with a breathing problem and back injury, respectively. With the first round complete, the only remaining seeds are No. 1 Sam Querrey of Las Vegas, No. 2 Tim Smyczek of Tampa, Fla., and No. 5 Denis Kudla of Boca Raton, Fla.
As if Querrey, a 6-foot-6 (1.98-meter) Davis Cup veteran who has been ranked as high as No. 17, needed any help, he already is the only seed left in his half of the draw. In addition to their academic success, Smith and Klahn fared pretty well on the court in college. Smith became the second player in NCAA Division I history to earn All-America honors in singles and doubles all four years, joining eventual world No. 1 doubles player Jon Leach of USC. Klahn won the 2010 NCAA singles title as a sophomore before undergoing surgery for a herniated disc at the beginning of his junior year. He bounced back to reach the NCAA singles quarterfinals and doubles final that year and the singles semis and doubles quarters as a senior. Both players are happy they stayed in college for four years. "I formed some great friendships, met some great people and had some good times," Smith said. "You can't replace that being on the tour. I got my degree, I've got my (general) backup plan, so now I can really enjoy tennis." Klahn has said he "had a great four years (at Stanford). I had a lot of fun and have a lot of memories." Smith and Klahn share more than their college backgrounds. Both are left-handed and have struggled with injuries this year. Smith developed a sore shoulder after playing tournaments in seven of eight weeks over the summer. "Traveling and playing takes a toll on your body," he said. "Those are the lessons you learn. This period here, I'm going to play for three weeks (in Napa, Sacramento and Tiburon) and then take a little break." Klahn, a Sacramento quarterfinalist last year, missed two months in the spring when his back flared up and five weeks over the summer with a foot sprain. "Physically, I feel very good," said Klahn, who has tumbled from a career-high No. 63 in the world in March to No. 118. "To be brutally honest, this has been a difficult year with injuries for me, but that's part of the tour. That's what you have to accept and deal with." Smith was clearly the sharper player today. He saved seven of nine break points (77 percent) to Klahn's 12 of 16 (75 percent) and had one double fault to Klahn's four. "I came out of the blocks pretty good," said Smith, who will face 16-year-old sensation Stefan Kozlov of Pembroke Pines, Fla., on Wednesday at 11 a.m. "I served pretty well, I thought. In the second set, he hit an unbelievable passing shot when I had break point. In the third set, I had break points in (almost) every game, so I was pretty happy with that." Smith recorded the only breaks of the third set in the third and final games. Both times, Klahn double-faulted for 0-40. Smith is ranked No. 230 in singles and No. 77 in doubles. He won the Sacramento doubles crown last year with countryman Matt Reid, but they are playing with different partners this year. Klahn lost to Smith for the first time in three matches. "He's a difficult player to play just because he doesn't give you any rhythm, and I feel like I'm still finding my rhythm again," Klahn said. "He kept me off-balance pretty well. I just didn't feel like I was able to find my range and my game today. "It's a tricky match. He serves well, he comes in a lot, and he has great hands around the net. I thought I did a good job finding my game and adjusting in the second set. A couple sloppy games on my serve in the third set, and that was it." John Millman, Australia, def. Tennys Sandgren, United States, 4-6, 6-3, 7-6 (3). Bjorn Fratangelo, United States, def. Frank Dancevic (8), Canada, 6-4, 6-4. Elias Ymer, Sweden, def. Eric Quigley, United States, 3-6, 6-0, 7-6 (2). John-Patrick Smith, Australia, def. Bradley Klahn (3), United States, 6-2, 2-6, 6-3. Daniel Nguyen, United States, def. Alex Kuznetsov, United States, 6-4, 7-6 (4). Marcos Giron, United States, def. Alex Bolt, Australia, 6-4, 6-4. Tim Smyczek (2), United States, def. Jordan Thompson, Australia, 6-1, 6-2. Wayne Odesnik, United States, def. Peter Polansky (6), Canada, 5-7, 6-4, 7-6 (5). Luca Vanni, Italy, def. Liam Broady, Great Britain, 6-7 (2), 6-3, 6-0. Dimitar Kutrovsky, Bulgaria, def. Michael Russell (4), United States, 3-2, retired. Jared Donaldson, United States, def. Thiemo de Bakker, Netherlands, 6-2, 3-0, retired. Sam Querrey (1), United States, def. Kyle Edmund, Great Britain, 7-6 (3), 6-4. Matt Reid, Australia, and Jose (Rubin) Statham, New Zealand, def. James Cluskey and James McGee, Ireland, 3-6, 6-4 [10-8]. Stefan Kozlov, United States, vs. John-Patrick Smith, Australia. Marcus Daniell and Artem Sitak (1), New Zealand, vs. Rik de Voest, South Africa, and Matt Seeberger, Los Altos (not before 12:30 p.m.). Tim Smyczek (2), United States, vs. James McGee, Ireland. Adam Hubble and John-Patrick Smith, Australia, vs. Thiemo de Bakker and Wesley Koolhof, Netherlands. Denis Kudla (5), United States, vs. Elias Ymer, Sweden. Wayne Odesnik, United States, vs. Rhyne Williams. Liam Broady, Great Britain, and Jordan Thompson, Australia, vs. Alex Bolt, Australia, and Frank Dancevic, Canada. Peter Polansky and Adil Shamasdin (2), Canada, vs. Denis Kudla and Rhyne Williams, United States. 6-1, 3-6, 6-3 in the first round of the Sacramento Challenger. SACRAMENTO, Calif. -- A few years ago, Ryan Harrison was in Stefan Kozlov's tennis shoes. U.S. teenage sensation. The next men's star in a nation starving for one. Future Grand Slam champion. Davis Cup hero. If only it were that simple. Since reaching No. 43 in the world two years ago at age 20, Harrison has gone into a tailspin. It's too soon to write off Harrison or anoint Kozlov, 16, as America's savior. But the future looks a whole lot brighter for Kozlov than his mentor at the moment. Kozlov stunned Harrison 6-1, 3-6, 6-3 on Monday in the first round of the $100,000 Sacramento Pro Circuit Challenger on a gorgeous, 81-degree (27.2 Celsius) day at the Natomas Racquet Club. It was Harrison's second opening-round loss to a U.S. teenager in six days. He fell to another potential star, 17-year-old Jared Donaldson, in the $50,000 Napa Challenger. At No. 183, Harrison is the highest-ranked player Kozlov has beaten. "This one means the world to me," said Kozlov, a wild card ranked No. 763 who turned pro two years ago. "I've worked over the years, and this was a really important step into my professional career, to become a great professional." Another U.S. prospect, 18-year-old Collin Altamirano of Sacramento, did not fare as well. Altamirano, last year's USTA boys 18 hardcourt champion and this year's runner-up, lost to fifth-seeded Denis Kudla of Boca Raton, Fla., 6-1, 6-1 in 49 minutes. And Robby Ginepri, the only active American man to reach a Grand Slam singles semifinal, succumbed to James McGee of Ireland 6-4, 6-1. Ginepri, who will turn 32 next Tuesday, fell to Andre Agassi in five sets in the 2005 U.S. Open semis. Kozlov reached the Australian Open boys final in January at 15. The result raised his junior world ranking to No. 2, the highest by a U.S. boy since Andy Roddick climbed to No. 1 in 2000. Roddick, the 2003 U.S. Open champion, is the last American man to win a Grand Slam singles title. In July, Kozlov advanced to the boys singles and doubles finals at Wimbledon. Featured in Tennis magazine's U.S. Open issue, he retired from his boys singles quarterfinal at Flushing Meadows early this month with a foot injury. During the Open, U.S. Davis Cup captain and Tennis Channel commentator Jim Courier crowed on a broadcast: "USTA coaches have been talking to me about Kozlov for three years. His biggest asset is his mind. He's a very crafty player with a lot of variety. He'll be in the top 50 by the time he's 20." Kozlov is from Pembroke Pines, Fla., in the Miami area, and Harrison trains up the road in Boca Raton. "We're really good friends," said Kozlov, who's named after International Tennis Hall of Famer Stefan Edberg. "He's helped me over the years to progress into a professional, given me tips. I really appreciate everything he's done for me, and we had a good match." Kozlov, who's four inches (10.2 centimeters) shorter and 30 pounds (13.6 kilograms) lighter than the 6-foot-2 (1.88-meter), 185-pound (84-kilogram) Harrison, lacks the veteran's explosive serve and shotmaking. But Kozlov, in addition to smarts, has excellent movement and great hands. Against Harrison, he displayed a dangerous, flat forehand, solid backhand, deft volley and feathery lob. Overall, Kozlov got enough balls back that Harrison generally made the first mistake. Whereas Kozlov finds ways to win, Harrison tends to lose his temper when things don't go his way. One point early in the second set was instructive. Kozlov not only returned an overhead smash but hit a lob just inside the baseline that Harrison sailed long. Harrison smashed his racket in frustration, incurring a warning. Of course, all the pressure was on Harrison as the favorite in the match. Kozlov had nothing to lose. And it was Harrison who cracked, double-faulting for the decisive break in the third set to give Kozlov a 4-2 lead. Kozlov's mental strength was especially apparent when he served for the match at 5-3 in the third set. Young players -- even experienced ones -- typically tighten up when they're on the verge of a big victory. Not Kozlov. Showing no signs of nerves, he held at 15 as Harrison sprayed a backhand down the line wide on match point. "It was a really mental match," Kozlov concluded. "I think our level (of play) was pretty similar. First set, I was mentally so solid. Second set, I was really unstable. I gave a game away (to suffer the only break of the set and trail 3-1). Third set, I just stayed tough and believed in my game, and I happened to win." Even though both players are American and Harrison has a short fuse, the crowd clearly favored the older player. Harrison was the bigger name, and maybe the fans sympathized with his plight. Kozlov admitted that the crowd's preference for Harrison "actually affected me a little bit. Third set, I didn't really care, but second set, it kind of got to me a little bit. After every point (for Harrison), they were kind of clapping, but I managed to stay tough." Eric Quigley, United States, def. Thomas Fabbiano (2), Italy, 6-3, 6-7 (2), 6-3. Marcos Giron (8), United States, def. Nils Langer (4), Germany, 6-3, 6-7 (9), 7-6 (4). Dimitar Kutrovsky (5), Bulgaria, def. Mitchell Frank, United States, 6-2, 6-3. Liam Broady (3), Great Britain, def. Alexander Ritschard, Switzerland, 6-4, 6-0. Rhyne Williams, United States, def. Louk Sorensen, Ireland, 4-6, 7-6 (3), 7-6 (2). Stefan Kozlov, United States, def. Ryan Harrison, United States, 6-1, 3-6, 6-3. James McGee, Ireland, def. Robby Ginepri, United States, 6-4, 6-1. Denis Kudla (5), United States, def. Collin Altamirano, Sacramento, 6-1, 6-1. Liam Broady, Great Britain, and Jordan Thompson, Australia, def. Sebastian Bader, Austria, and Erik Elliott, United States, 7-6 (5), 1-6 [12-10]. Adam Hubble and John-Patrick Smith, Australia, def. Sekou Bangoura and Tennys Sandgren (4), United States, 6-1, 6-4. Thiemo de Bakker and Wesley Koolhof, Netherlands, def. Thomas Fabiano and Luca Vanni, Italy, 6-3, 6-4. Alex Kuznetsov and Vahid Mirzadeh, United States, def. Alexios Halebian, United States, and Dennis Novikov, San Jose, 5-7, 6-4 [10-2]. John Millman, Australia, vs. Tennys Sandgren, United States. Bradley Klahn (3), United States, vs. John-Patrick Smith, Australia. Tim Smyczek (2), United States, vs. Jordan Thompson, Australia. Eric Quigley, United States, vs. Elias Ymer, Sweden. Liam Broady, Great Britain, vs. Luca Vanni, Italy. Michael Russell (4), United States, vs. Dimitar Kutrovsky, Bulgaria. Frank Dancevic (8), Canada, vs. Bjorn Fratangelo, United States. Alex Kuznetsov, United States, vs. Daniel Nguyen, United States. Peter Polansky (6), Canada, vs. Wayne Odesnik, United States. Thiemo de Bakker (7), Netherlands, vs. Jared Donaldson, United States. Matt Reid, Australia, and Jose (Rubin) Statham, New Zealand, vs. James Cluskey and James McGee, Ireland. and tournament director Chris Arns after winning the Napa Valley Challenger. NAPA, Calif. -- It was great news for tournament director Chris Arns when Sam Querrey requested a late wild card for the $50,000 Napa Valley Challenger. It wasn't so swell for Tim Smyczek. The 6-foot-6 (1.98-meter) Querrey, a Davis Cup veteran who has been ranked as high as No. 17 in the world, overpowered the 5-foot-9 (1.75-meter) Smyczek 6-3, 6-1 today for the title of the second annual tournament. the general manager of the Napa Valley Country Club, and Arns. Querrey was born in San Francisco and grew up in nearby Santa Rosa before moving to Las Vegas at 7 and Thousand Oaks in the Los Angeles area at 10. His father, Mike, is a mortgage banker, and his mother, Chris, is a housewife. Rather than travel to Asia to play on the elite ATP World Tour, Querrey chose the three-week Northern California swing through Napa, Sacramento and Tiburon on the lower-level Challenger tour. "I was (going to be) in the qualifying of Tokyo and Shanghai, not in the main draw," explained Querrey, who lives in Las Vegas. "I don't have a coach right now. David Nainkin and I (parted) ways earlier in the year. I didn't want to go all the way over there by myself. in 54 minutes for the title. Querrey used his devastating serve and forehand to improve to 3-1 against Smyczek (pronounced SMEE-check), who grew up in Milwaukee and trains in Tampa, Fla. The previous matches had been close, with Smyczek winning the last one. That came in the first round of an ATP grass-court tournament in Newport, R.I., last year. This time, several factors conspired to doom Smyzcek in the one-sided match. Querrey has played well lately after falling to No. 175 James Ward in the United States' 3-1 upset loss to Great Britain in the first round of the Davis Cup in San Diego in February. In his last three competitions before Napa, Querrey reached the semifinals at Winston-Salem, N.C., for the third straight year, reached the third round of the U.S. Open before losing to top-ranked Novak Djokovic in straight sets and won both of his matches in a 5-0 victory over Slovakia in Chicago in the Davis Cup World Group playoffs. Querrey blasted 10 aces to Smyczek's none, converted 71 percent of his first serves and won 80 percent of the points on his first delivery. He saved all three break points against him. "I'm feeling confident, feeling good," said Querrey, who has won seven career ATP singles titles. "I don't think (Smyczek) had his best day out here, but I felt like I kept the pressure on him and served really well. That's usually the key for me." Then there was Querrey's homecourt advantage. "I'm very comfortable here," he emphasized. "I love playing in California." Smyczek, meanwhile, complained that "my game in general was not very sharp today. It might not have even mattered. Sam was serving at a really high percentage, and when he does that, he really makes it tough on guys. Today, he just played too (well)." Smyczek was coming off a 3-6, 6-4, 6-3 win over 17-year-old Jared Donaldson, arguably the United States' top teenage prospect, in their first meeting. "Yesterday's singles match was not so much physically tiring as it was a little mentally tiring," said Smyczek, who will remain No. 99. "I had some nerves coming out, and that's normal playing a young kid who's as good as Jared is. It took a lot mentally for me to get through that match." Smyczek added that the 6-foot-2 (1.88-meter) Donaldson has "a lot of potential. He's got a couple of big weapons (the serve and forehand), but the main thing is he's so solid with everything he does. You don't see that very often in a player his age. Smyczek fought to a 2-2 tie in the first set of the final, but Querrey reeled off 10 of the last 12 games. "Early on, I had a tough service game at 2-all," said Querrey, who roomed with Smyczek at the Arnses' house during the week. "We were kind of back and forth. When I got through that, I gained a little confidence. Then I was able to swing out a little more and play a little more aggressively." Querrey could sweep the Napa, Sacramento and Tiburon titles. "I feel I've got a little momentum right now," he said. "I played well not only in this tournament but in the Davis Cup and U.S. Open. It's the best I've felt all year. Hopefully, I'll ride it out through the rest of the year and finish strong." Smyczek also lost in the doubles final for the second consecutive year. Top-seeded Peter Polansky and Adil Shamasdin of Canada defeated second-seeded Bradley Klahn, a former NCAA singles champion from Stanford, and Smyczek 7-6 (0), 6-1. In last year's doubles final, Bobby Reynolds of Marietta, Ga., and John-Patrick Smith of Australia topped Steve Johnson of Orange, Calif., and Smyczek. Reynolds retired in July at 32. Fifth-seeded Denis Kudla of Boca Raton, Fla., will meet Collin Altamirano, an 18-year-old wild card playing in his hometown, on Monday in the first round of the $100,000 Sacramento Pro Circuit Challenger. The match is scheduled to begin not before 4:30 p.m. at the Natomas Racquet Club. Kudla, 22, will be playing his second match since July after being diagnosed with mononucleosis. Seeded seventh in this week's $50,000 Napa Challenger, he lost to countryman Alex Kuznetsov 6-2, 3-6, 7-5 in the first round. Both Kudla and Kuznetsov were born in Kiev, Ukraine, and moved to the United States at a young age. Kuznetsov, however, is five years older. Kudla was seeded first in last year's Sacramento Challenger but lost in the first round to Daniel Cox of Great Britain 7-5, 6-0. Altamirano won last year's USTA Boys 18 National Championships in Kalamazoo, Mich., and was the runner-up there this year to Noah Rubin, the reigning Wimbledon boys champion. Also on Monday, Ryan Harrison will face teenage sensation Stefan Kozlov in a matchup of top American hopes. Kozlov, a 5-foot-10 (1.78-meter) right-hander who's named after International Tennis Hall of Famer Stefan Edberg, is ranked No. 762 in the world. But Jim Courier, the U.S. Davis Cup captain and a Tennis Channel commentator, asserted during the recent U.S. Open that Kozlov "will be in the top 50 by the time he's 20." Harrison did exactly that two years ago at 20, ascending to a career-high No. 43. However, the intense, volatile Boca Raton resident has plunged to No. 183. Meanwhile, 31-year-old Robby Ginepri, the only active American man to reach a Grand Slam singles semifinal, will play James McGee of Ireland not before 3:30 p.m. Ginepri lost to Andre Agassi in five sets in the 2005 U.S. Open semis. In the second round of Sacramento qualifying on Sunday, Mitchell Frank of Annandale, Va., ousted top-seeded Matt Reid of Australia 6-2, 6-3. Reid gained direct entry in last year's Sacramento Challenger and advanced to the quarterfinals before losing to eventual champion Donald Young. The 57th-ranked Young is playing in Tokyo on the elite ATP World Tour next week. Frank clinched Virginia's first NCAA team title with a 0-6, 7-5, 6-4 win over UCLA's Adrien Puget at No. 3 singles in last year's final, saving a championship point in the process. Now a senior at Virginia, Frank will meet fifth-seeded Dimitar Kutrovsky of Bulgaria today at 11 a.m. for a berth in the main draw. Admission to the Sacramento Challenger is $5 daily through Thursday, $10 for Friday's quarterfinals and $15 daily for Saturday's semifinals and the Oct. 5 finals. Liam Broady (3), Great Britain, def. Lovedeep Singh, Sacramento, 6-1, 6-0. Alexander Ritschard, Switzerland, def. Spencer Papa, United States, 6-2, 6-4. Thomas Fabbiano (2), Italy, def. Philip Bester, Canada, 7-6 (4), 7-6 (6). Eric Quigley, United States, def. Dennis Novikov, San Jose, 7-6 (6), 6-4. Nils Langer (4), Germany, def. Sekou Bangoura, United States, 7-6 (1), 6-3. Mitchell Frank, United States, def. Matt Reid (1), Australia, 6-2, 6-3. Marcos Giron (8), United States, def. Alexios Halebian, United States, 6-4, 7-6 (3). Dimitar Kutrovsky (5), Bulgaria, def. Lucas Gomez, Mexico, 6-1, 6-2. Sebastian Bader, Austria, and Erik Elliott (2), United States, def. Nils Langer, Germany, and Louk Sorensen, Ireland, walkover. Mitchell Frank, United States, vs. Dimitar Kutrovsky (5) (final-round qualifying). Ryan Harrison, United States, vs. Stefan Kozlov, United States (not before 1 p.m.). Alex Kuznetsov and Vahid Mirzadeh, United States, vs. Alexios Halebian and Dennis Novikov, United States. Denis Kudla (5), United States, vs. Collin Altamirano, Sacramento (not before 4:30 p.m.). Thomas Fabbiano (2), Italy, vs. Eric Quigley, United States (final-round qualifying). Rhyne Williams, United States, vs. Louk Sorensen, Ireland (not before 11:30 a.m.). Thomas Fabbiano and Luca Vanni, Italy, vs. Thiemo de Bakker and Wesley Koolhof, Netherlands. Robby Ginepri, United States, vs. James McGee, Ireland (not before 3:30 p.m.). Nils Langer (4), Germany, vs. Marcos Giron (8), United States (final-round qualifying). Liam Broady, Great Britain, vs. Alexander Ritschard, Switzerland (final-round qualifying). Sekou Bangoura and Tennys Sandgren, United States, vs. Adam Hubble and John-Patrick Smith, Australia. Liam Broady, Great Britain, and Jordan Thompson, Australia, vs. Sebastian Bader, Austria, and Erik Elliott, United States (final-round qualifying). Challenger next week against fifth-seeded Denis Kudla. Three of the United States' top prospects will play in next week's $100,000 Sacramento Pro Circuit Challenger. Collin Altamirano, 18, of Sacramento and Stefan Kozlov, 16, of Pembroke Pines, Fla., received wild cards into the main draw, which begins Monday at the Natomas Racquet Club. Jared Donaldson, 17, of Chepachet, R.I., and Irvine also is entered. Altamirano, who won last year's USTA Boys 18 National Championships in Kalamazoo, Mich., will meet fifth-seeded Denis Kudla of Boca Raton, Fla., in the first round. Kozlov, the runner-up in Australian Open boys singles in January at 15, will take on 22-year-old Ryan Harrison, once considered the United States' greatest hope. Donaldson, who reached his first Challenger semifinal this week in Napa, will meet seventh-seeded Thiemo de Bakker, the 2006 Wimbledon boys singles champion from the Netherlands who climbed to a career-high No. 40 in 2010. Americans Sam Querrey and Tim Smyczek are seeded first and second, respectively, for the second straight week in Sacramento. They will meet in today's Napa final. In first-round singles qualifying on Saturday, hard-serving Dennis Novikov of San Jose edged Denmark's Frederik Nielsen 7-6 (3), 6-7 (1), 6-4. Nielsen won the Wimbledon men's doubles title two years ago with Jonathan Marray of Great Britain and reached the quarterfinals of the 2010 Sacramento Challenger. Philip Bester, Canada, def. Clay Thompson, United States, 6-4, 6-2. Thomas Fabbiano (2), Italy, def. Wesley Koolhof, Netherlands, 6-4, 6-4. Eric Quigley, United States, def. Fritz Wolmarans (6), South Africa, 1-6, 7-5, 6-4. Dennis Novikov, United States, def. Frederik Nielsen, Denmark, 7-6 (3), 6-7 (1), 6-4. Liam Broady (3), Great Britain, def. Antonio Massara, Italy, 6-4, 7-5. Lovedeep Singh, Sacramento, def. Brett Bacharach, Newcastle, 3-6, 6-3, 6-4. Alexander Ritschard, Switzerland, def. Tigre Hank (7), Mexico, 6-1, 7-5. Spencer Papa, United States, def. Harry Bourchier, Australia, 5-7, 7-5, 7-6 (5). Alexios Halebian, United States, def. Erik Elliott, United States, 6-3, 3-6, 6-3. Nils Langer (4), Germany, def. Mico Santiago, United States, 6-0, 6-2. Marcos Giron (8), United States, def. Brandon Sutter, El Dorado Hills, 6-0, 6-2. Sekou Bangoura, United States, def. Yale Goldberg, United States, 6-0, 6-1. Matt Reid (1), Australia, def. Salvatore Caruso, Italy, 6-3, 6-2. Dimitar Kutrovsky (5), Bulgaria, def. Robert Shulman, United States, 6-0, 6-1. Mitchell Frank, United States, def. Jose (Rubin) Statham, New Zealand, 6-3, 3-6, 6-3. Lucas Gomez, Mexico, def. James Cluskey, Ireland, 7-6 (2), 6-1. Liam Broady (3), Great Britain, vs. Lovedeep Singh, Sacramento. Nils Langer (4), Germany, vs. Sekou Bangoura, United States. Thomas Fabbiano (2), Italy, vs. Philip Bester, Canada. Marcos Giron (8), United States, vs. Alexios Halebian, United States. Spencer Papa, United States, vs. Alexander Ritschard, Switzerland. Matt Reid (1), Australia, vs. Mitchell Frank, United States. Dennis Novikov, United States, vs. Eric Quigley, United States. Dimitar Kutrovsky (5), Bulgaria, vs. Lucas Gomez, Mexico. Sam Querrey and Tim Smyczek wouldn't seem to have much in common. After all, Querrey is 6-foot-6 (1.98 meters), and Smyczek (pronounced SMEE-check) is 5-foot-9 (1.75 meters). --Querrey and Smyczek are seeded first and second, respectively, in this week's $50,000 Napa Valley Challenger. --They're both American, although Querrey grew up in sunny Southern California and Smyczek in frigid Milwaukee. --And they both skipped college to turn pro. Querrey, ranked 54th in the world after climbing to a career-high No. 17 in early 2011, and Smyczek, ranked 99th, will meet today at 1 in the final at the Napa Valley Country Club after beating unseeded upstarts. Querrey, a native of nearby San Francisco, cruised past Alex Bolt, a 21-year-old left-hander from Australia, 6-2, 6-3 in 55 minutes. Bolt reached the Australian Open doubles quarterfinals with countryman Andrew Whittington in January. Smyczek overcame 17-year-old Jared Donaldson, perhaps the United States' top prospect, 3-6, 6-4, 6-3. Smyczek also lost the first set in his second-round victory over American Bjorn Fratangelo. Querrey leads the head-to-head series 2-1, but Smyczek won their last meeting 6-4, 7-6 (8) in the first round on grass at Newport, R.I., in 2013. Querrey also was seeded first there. At Napa Valley Country Club in Napa, Calif.
Sam Querrey (1), United States, def. Alex Bolt, Australia, 6-2, 6-3. Tim Smyczek (2), United States, def. Jared Donaldson, United States, 3-6, 6-4, 6-3. Bradley Klahn and Tim Smyczek (2), United States, def. Alex Bolt, Australia, and Frank Dancevic, Canada, 6-4, 6-3. Sam Querrey (1), United States, vs. Tim Smyczek (2), United States. Peter Polansky and Adil Shamasdin (1), Canada, vs. Bradley Klahn and Tim Smyczek (2), United States. Teenage sensation Stefan Kozlov and former USC star Daniel Nguyen received wild cards into the $100,000 Sacramento Pro Circuit Challenger, the USTA announced Friday. Qualifying begins today at 10 at the Natomas Racquet Club, and the main draw is scheduled for Monday through Oct. 5. Admission for today and Sunday is free, $5 daily for Monday through Thursday, $10 for Friday's quarterfinals and $15 per day for the Oct. 4 semifinals and Oct. 5 finals. Kozlov, 16, of Pembroke Pines, Fla., is ranked No. 762 in the world. He reached the Australian Open boys final at 15 in January and the second round of men's qualifying in the recent U.S. Open. Nguyen, a 23-year-old Long Beach native, is ranked No. 382. One of the few members of four NCAA Division I championship teams (2009-12), he clinched the Trojans' victories in 2010 and 2011. Other four-time team champions are Nguyen's teammate, Steve Johnson, and Stanford's Paul Goldstein (1995-98), the Cardinal's new coach. Clay Thompson, United States, vs. Philip Bester, Canada. Liam Broady (3), Great Britain, vs. Antonio Massara, Italy. Alexios Halebian, United States, vs. Erik Elliott, United States. Matt Reid (1), Australia, vs. Salvatore Caruso, Italy. Thomas Fabbiano (2), Italy, vs. Wesley Koolhof, Netherlands. Tigre Hank (7), Mexico, vs. Alexander Ritschard, Switzerland. Marcos Giron (8), United States, vs. Brandon Sutter, El Dorado Hills. Michell Frank, United States, vs. Jose (Rubin) Statham, New Zealand. Dennis Novikov, San Jose, vs. Frederik Nielsen, Denmark. Brett Bacharach, Newcastle, vs. Lovedeep Singh, Sacramento. Nils Langer (4), Germany, vs. Mico Santiago, United States. Dimitar Kutrovsky (5), Bulgaria, vs. Robert Shulman, Canada. Fritz Wolmarans (6), South Africa, vs. Eric Quigley, United States. Spencer Papa, United States, vs. Harry Bourchier, Australia. Sekou Bangoura, United States, vs. Yale Goldberg, United States. Lucas Gomez, Mexico, vs. James Cluskey, Ireland. It will be two American veterans against two upstarts in the semifinals of the $50,000 Napa Valley Challenger. Top-seeded Sam Querrey, a native of nearby San Francisco living in Las Vegas, will face unseeded Alex Bolt of Australia at noon at the Napa Valley Country Club. Then second-seeded Tim Smyczek of Tampa, Fla., will play unseeded Jared Donaldson, 17, of Chepachet, R.I., and Irvine. Querrey and Smyczek (pronounced SMEE-check), both 26, will meet their opponents for the first time. The 6-foot-6 (1.98-meter) Querrey led 3-0 when sixth-seeded Michael Russell, 36, of Houston retired with a back injury. Querrey improved to 8-0 against the 5-foot-8 (1.73-meter) Russell. Bolt, 21, defeated countryman John Millman 6-3, 7-6 (3). Bolt reached the doubles quarterfinals of the Australian Open with Aussie Andrew Whittington in January and won the singles title of a Challenger on clay in An-Ning, China, in May. Smyczek, only 5-foot-9 (1.75 meters) and 160 pounds (73 kilograms), demolished Liam Broady of Great Britain 6-1, 6-1 in 59 minutes to reach the Napa semifinals for the second straight year. Donaldson, perhaps the United States' top male prospect, eliminated qualifier Julian Lenz of Germany 7-6 (4), 6-3. Jared Donaldson, United States, def. Julian Lenz, Germany, 7-6 (4), 6-3. Tim Smyczek (2), United States, def. Liam Broady, Great Britain, 6-1, 6-1. Alex Bolt, Australia, def. John Millman, Australia, 6-3, 7-6 (3). Sam Querrey (1), United States, def. Michael Russell (6), United States, 3-0, retired. Peter Polansky and Adil Shamasdin (1), Canada, def. Alex Kuznetsov, United States, and Nils Langer, Germany, 3-6, 6-3 [10-5]. Sam Querrey (1), United States, vs. Alex Bolt, Australia. Jared Donaldson, United States, vs. Tim Smyczek (2), United States. Alex Bolt, Australia, and Frank Dancevic, Canada, vs. Bradley Klahn and Tim Smyczek (2), United States. It doesn't quite compare to Joe DiMaggio's 56-game hitting streak or Cal Ripken's 2,632 consecutive games played. But Marcos Baghdatis' streak of consecutive Challenger victories this year was pretty impressive. It ended Thursday at 16 when the third-seeded Baghdatis retired from his second-round match in the $50,000 Napa Valley Challenger with Australia's John Millman leading 6-2, 3-0 at the Napa Valley Country Club. Baghdatis reinjured his right ankle, which forced him to retire from his first-round match in the U.S. Open last month against eventual champion Marin Cilic. Baghdatis withdrew from the Sacramento and Tiburon Challengers in the next two weeks. Until Thursday, Baghdatis had been undefeated in 2014 Challengers. The 29-year-old Cypriot won the titles at Nottingham in June and Vancouver and Aptos in consecutive weeks in July and August. Baghdatis reached the final of the 2006 Australian Open, losing Roger Federer, and climbed to a career-high No. 8 in the world later that year. He is now No. 108. Millman, the 2010 Sacramento Challenger champion who has had his own injury issues, will face countryman Alex Bolt in today's quarterfinals. Bolt, an Australian Open doubles quarterfinalist this year, outlasted 20-year-old Dennis Novikov of San Jose 4-6, 6-2, 6-4. The other quarterfinal in the top half of the draw will be an all-American encounter. Top-seeded Sam Querrey, a 26-year-old native of nearby San Francisco, will meet 36-year-old Michael Russell, seeded sixth. The 6-foot-6 (1.98-meter) Querrey is 7-0 against the 5-foot-8 (1.73-meter) Russell. Querrey needed 2 hours, 20 minutes to defeat 18-year-old Elias Ymer of Sweden 6-7 (6), 7-6 (5), 6-3. Ymer was up a break at 4-3 in the second set. Russell topped American Rhyne Williams, a quarterfinalist in last year's inaugural Napa Valley Challenger, 4-6, 6-0, 6-1. Michael Russell (6), United States, def. Rhyne Williams, United States, 4-6, 6-0, 6-1. Alex Bolt, Australia, def. Dennis Novikov, San Jose, 4-6, 6-2, 6-4. John Millman, Australia, def. Marcos Baghdatis (3), Cyprus, 6-2, 3-0, retired. Sam Querrey (1), United States, def. Elias Ymer, Sweden, 6-7 (6), 7-6 (5), 6-3. Bradley Klahn and Tim Smyczek (2), United States, def. Liam Broady, Great Britain, and Jordan Thompson, Australia, 6-2, 7-6 (4). Alex Kuznetsov, United States, and Nils Langer, Germany, def. Adam Hubble and John-Patrick Smith, Australia, 6-3, 6-4. Peter Polansky and Adil Shamasdin (1), Canada, def. Denis Kudla and Michael Russell, United States, 6-4, 3-6 [10-7]. Julian Lenz, Germany, vs. Jared Donaldson, United States. Tim Smyczek (2), United States, vs. Liam Broady, Great Britain. Sam Querrey (1), United States, vs. Michael Russell, United States (not before 2 p.m.). Peter Polansky and Adil Shamasdin (1), Canada, vs. Alex Kuznetsov, United States, and Nils Langer, Germany. John Millman, Australia, vs. Alex Bolt, Australia. NAPA, Calif. -- They were two of the few Americans in a stadium far from home. The scene was the 5,500-seat Center Court at the Buenos Aires Lawn Tennis Club, known as the "Cathedral of Argentine Tennis" in a nation that has produced Guillermo Vilas, Gabriela Sabatini, David Nalbandian and Juan Martin del Potro. Wayne Odesnik, a lucky loser and the only U.S. player in the draw, was facing Nalbandian at night in the first round of the 2012 Copa Claro, a clay-court tournament on the ATP World Tour. In the stands was Jared Donaldson, an obscure 15-year-old player from that noted tennis hotbed of Rhode Island, with his father, Courtney. They recently had moved to Buenos Aires so the lanky Jared could train on clay and work on his movement and point construction. Two and a half years later, Donaldson faced Odesnik on the court Wednesday at the beautiful Napa Valley Country Club and advanced to his first Challenger quarterfinal. It won't go down as a classic. Donaldson converted only 35 percent of his first serves, and Odesnik retired with an inflamed left big toe with Donaldson leading 6-2, 3-1, 30-0. But it was poignant for Donaldson. Odesnik won the 2007 Sacramento Challenger at the Sutter Lawn Tennis Club but was suspended for one year in 2010 for importing human growth hormone into Australia. The 28-year-old left-hander from Florida might be the only American man or woman who lists clay as his or her favorite surface. He lost to Nalbandian, the 2002 Wimbledon runner-up and former world No. 3 who retired last year at 31 after numerous injuries, 6-2, 6-3 in Buenos Aires. "It's funny, actually," Donaldson recalled. "When I was down there, I didn't know I was going to be as good as I am now or as good as I could be. I was just playing tennis and looking up to a lot of those guys playing down there and saying, 'Another American is in Argentina; he's playing.' I thought that was really cool. Now that I have the chance to play these guys, it's pretty special for me." Also advancing Wednesday was Liam Broady, a 20-year-old left-hander from Great Britain who defeated 2013 Napa semifinalist Alex Kuznetsov of Tampa, Fla., 7-6 (6), 6-4. Kuznetsov had a set point in the tiebreaker on Broady's serve and led 4-1 (one service break) in the second set. In Friday's quarterfinals, Donaldson will play hard-serving Julian Lenz, a 21-year-old German qualifier, and Broady will meet second-seeded Tim Smyczek of Tampa, Fla. The other quarterfinal matchups will be determined today. Under the tutelage of former top-25 player Taylor Dent, the 6-foot-2 (1.88-meter) Donaldson suddenly has emerged as perhaps the United States' top teenage prospect at 17. He and junior rival Collin Altamirano of Sacramento trained with Roger Federer for two weeks last December in Dubai, where the Swiss star has a residence. At No. 342 in the world, Donaldson is the third-youngest player in the top 350 after No. 140 Borna Coric of Croatia and No. 149 Alexander Zverev of Germany. Donaldson will turn 18 on Oct. 9, the 6-foot-1 (1.85-meter) Coric on Nov. 14 and the 6-foot-6 (1.98-meter) Zverev next April 20. Donaldson won three consecutive Futures titles (in four weeks) in June and qualified for his first main draw on the elite ATP World Tour in Washington, D.C., before losing to 30-year-old American Rajeev Ram 6-7 (1), 6-4, 7-5 in the opening round. Donaldson turned pro last month just before the U.S. Open, allowing him to pocket $35,754 for losing to 20th-seeded Gael Monfils of France 6-4, 6-2, 6-4 in the first round as a wild card at Flushing Meadows. Monfils advanced to the quarterfinals and had two match points against Federer in a five-set loss. Donaldson trained in Buenos Aires for 2 1/2 years and said it helped his game "tremendously." Andy Murray left his native Scotland at 15 and practiced on clay in sunny Barcelona, Spain, for the same amount of time. Shortly after Donaldson returned to the United States early last year, he reached the final of the USTA Boys 18 National Championships in Kalamazoo, Mich. Donaldson fell to Altamirano, who's 10 months older, 6-1, 6-2, 6-4 in the title match but routed him in their next meeting less than a year later, 6-2, 6-1, en route to the title of the $15,000 Oklahoma City Futures. "At Kalamazoo, when I lost in the finals to him, it was really my breakout tournament. Same thing for him. I was never really the best (junior). I was good, but I wasn't the best or even close to it, to be honest. But I've been working really, really hard because I've always wanted to be really, really good," the candid Donaldson said of his turnaround against Altamirano. "My goal is to win Slams eventually, so I've been working really, really hard, and I've just been trying to be a professional my entire career. Even when I wasn't labeled a professional, I was training like one and had the mindset of a professional." Donaldson began working with Dent last November after attending his academy in Fountain Valley in the Los Angeles area. The affable Dent is the 33-year-old son of Australian Phil Dent, who lost to Jimmy Connors in the final of the 1974 Australian Open, and American Betty Ann (Grubb) Stuart, who reached the women's doubles final in the 1977 U.S. Open with transsexual Renee Richards. Taylor Dent is married to former WTA player Jennifer Hopkins. Dent, a rare serve-and-volleyer, reached a career-high No. 21 in the world in 2005 before undergoing three back operations. He returned to the top 100 in 2009 but retired the following year at 29. "He's helped me in a number of aspects," Donaldson said. "He's been a great influence on my serve. That's the real reason I went to him at first. My serve was a huge liability. Even though I didn't showcase it (Wednesday) as well as I would have liked, it has really become a strength in my game. Before, I never had confidence in it. Now, even when I don't have good days like (Wednesday), I still have confidence that I'm going to go up to the line and hit a really good first serve. "He's also helped me with my forehand, my backhand, my net game, my mental game, my defense, everything. He's been a huge influence on me on the court and also off the court. He was a 17-year-old, too, coming up and playing on the tour. Also, he's just a really, really nice person. I'm lucky that I have him around." Training with Federer in Dubai reinforced Dent's instructions about court positioning, opening up the court, accuracy on groundstrokes and serves, and defense. "I hadn't been working with him that long," Donaldson noted. "Not that I didn't believe him or have confidence in what he was saying, but I was still unsure. Look, I'm a pretty stubborn person. If someone tells me something, I don't just blindly accept it. I really need to understand it and believe it if I'm going to implement it into my game. I was a little hesitant about what he was saying. I didn't have full faith in it. "When I saw that Federer was doing the same things that I was trying to work on -- obviously he was doing it at a much higher level -- it gave me a lot of confidence in Taylor. I said, 'Taylor's right. He's telling me the truth. He's telling me what I need to hear.' "
Donaldson began playing at 4 years old at the Kirkbrae Country Club in Lincoln, a suburb of Providence in the smallest state in area in the United States. The club has four hardcourts but, despite the snowy winters, none indoors. "My parents saw that I took an interest in tennis, and they started (paying for) private lessons. One thing led to another, and here I am." On the ATP World Tour web site, Donaldson says he'd be a poker player if he weren't a touring pro in tennis. "I really like playing poker, and I've studied the game pretty in-depth," he said. Donaldson attributes his interest to the "Moneymaker Effect." "When I was 6, I was watching ESPN, and I saw Moneymaker win the main event," Donaldson said. "I was like, 'Poker looks fun,' so I started playing." Will Donaldson reach tennis stardom? He's betting on it. Tim Smyczek (2), United States, def. Bjorn Fratangelo, United States, 4-6, 6-3, 6-1. Liam Broady, Great Britain, def. Alex Kuznetsov, United States, 7-6 (6), 6-4. Julian Lenz, Germany, def. Daniel Nguyen, United States, 7-6 (4), 6-2. Jared Donaldson, United States, def. Wayne Odesnik, United States, 6-2, 3-1, 30-0, retired. Denis Kudla and Michael Russell, United States, def. Wesley Koolhof, Netherlands, and Elias Ymer, Sweden, 4-6, 7-6 (3) [10-7]. Peter Polansky and Adil Shamasdin (1), Canada, def. Bjorn Fratangelo and Marcos Giron, United States, 6-2, 6-3. Alex Kuznetsov, United States, and Nils Langer, Germany, def. James Cluskey and James McGee, Ireland, 7-6 (4), 6-3. Liam Broady, Great Britain, and Jordan Thompson, Australia, def. Julio Peralta, Chile, and Matt Seeberger, Los Altos, 7-6 (5), 6-7 (6) [10-7]. Alex Bolt, Australia, and Frank Dancevic, Canada, def. Sekou Bangoura and Vahid Mirzadeh (3), United States, 7-6 (4), 1-6 [10-7]. Michael Russell (6), United States, vs. Rhyne Williams, United States. Bradley Klahn and Tim Smyczek (2), United States, vs. Liam Broady, Great Britain, and Jordan Thompson, Australia. Marcos Baghdatis (3), Cyprus, vs. John Millman, Australia (not before 2 p.m.). Sam Querrey (1), United States, vs. Elias Ymer, Sweden (not before 4 p.m.). Dennis Novikov, San Jose, vs. Alex Bolt, Australia. Adam Hubble and John-Patrick Smith, Australia, vs. Alex Kuznetsov, United States, and Nils Langer, Germany. Peter Polansky and Adil Shamasdin (1), Canada, vs. Denis Kudla and Michael Russell, United States. Not so long ago, Ryan Harrison was considered the top prospect in U.S. men's tennis. Now that distinction might go to Jared Donaldson. Donaldson, 17, of Chepachet, R.I., and Irvine surprised Harrison 6-3, 7-5 today in the first round of the $50,000 Napa Valley Challenger at the Napa Valley Country Club. Also, two seeds lost for the second straight day. Monday's victims, No. 4 Bradley Klahn and No. 7 Denis Kudla, are American. Today's casualties, No. 5 Peter Polansky and No. 8 Frank Dancevic, are Canadian. Alex Bolt of Australia knocked off Polansky, who won last year's $100,000 Tiburon Challenger, 6-3, 6-2. Bolt, a 21-year-old left-hander, reached the Australian Open doubles quarterfinals in January with countryman Andrew Whittington. American qualifier Daniel Nguyen took out Dancevic 6-3, 6-7 (6), 6-3. Nguyen, a 23-year-old native of Oxnard, Calif., helped USC win four NCAA championships (2009-12). After the first round in Napa, No. 2 Tim Smyczek of Tampa, Fla., is the only seed left in the bottom half of the draw. Hopes were high for Harrison when he reached a career-high No. 43 in the world two years ago at 20. However, the intense, temperamental resident of Boca Raton, Fla., has plunged to No. 185. Donaldson, 6-foot-2 (1.88 meters), turned pro last month after winning three consecutive Futures titles (in four weeks) in June and qualifying for his first main draw on the elite ATP World Tour in Washington, D.C. There, he lost to American veteran Rajeev Ram 6-7 (1), 6-4, 7-5 in the opening round. As a wild card in the recent U.S. Open, Donaldson lost to 20th-seeded Gael Monfils of France 6-4, 6-2, 6-4 in the first round. Monfils advanced to the quarterfinals and had two match points against Roger Federer in a five-set loss. In other Napa first-round matches, top-seeded Sam Querrey of Las Vegas and third-seeded Marcos Baghdatis of Cyprus advanced in straight sets. Querrey, a 26-year-old native of nearby San Francisco, defeated qualifier Frederik Nielsen of Denmark 7-6 (5), 6-3. Nielsen and Jonathan Marray of Great Britain in 2012 became the first wild cards to win the Wimbledon men's doubles title. Baghdatis, the 2006 Australian Open runner-up to Federer, improved to 16-0 in Challengers this year with a 6-3, 6-2 victory over wild card Marcos Giron of Thousand Oaks in the Los Angeles area. Baghdatis has won Challengers in Nottingham, Vancouver and Aptos this year. The latter two came in consecutive weeks in August. Giron, only 5-foot-10 (1.78 meters), turned pro in July after winning the NCAA singles title as a UCLA junior. 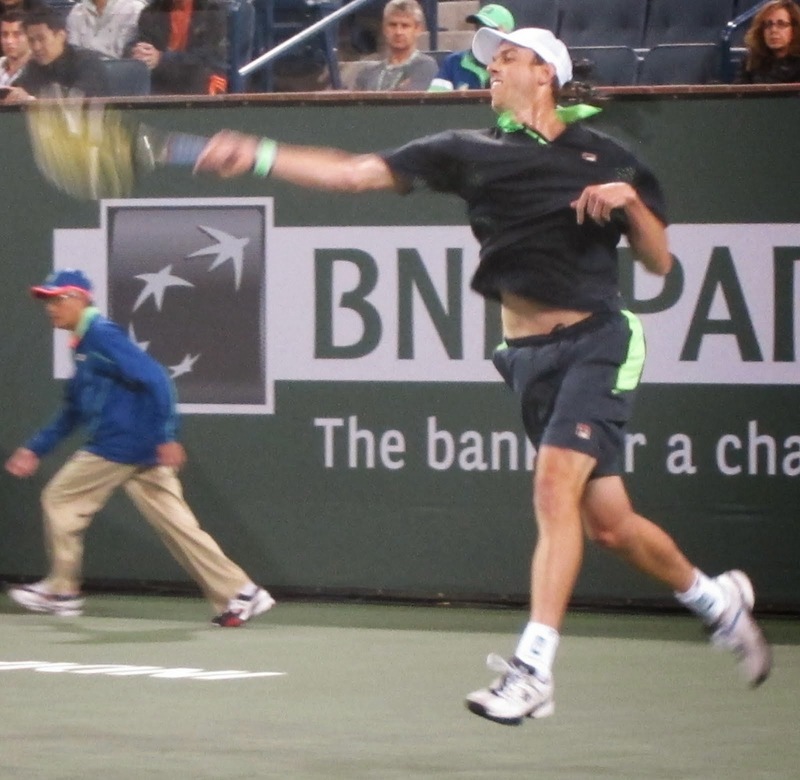 He graduated from Thousand Oaks High School, Querrey's alma mater. Michael Russell, United States, def. Tennys Sandgren, United States, 4-6 6-4, 6-2. Elias Ymer, Sweden, def. James McGee, Ireland, 7-5, 6-3. Daniel Nguyen, United States, def. Frank Dancevic (8), Canada, 6-3, 6-7 (6), 6-3. Jared Donaldson, United States, def. Ryan Harrison, United States, 6-3, 7-5. Julian Lenz, Germany, def. John-Patrick Smith, Australia, 6-3, 2-6, 6-4. Tim Smyczek (2), United States, def. Nils Langer, Germany, 6-3, 6-1. Sam Querrey (1), United States, def. Frederik Nielsen, Denmark, 7-6 (5), 6-3. Rhyne Williams, United States, def. Jordan Thompson, Australia, 7-6 (6), 1-6, 7-5. Marcos Baghdatis (3), Cyprus, def. Marcos Giron, United States, 6-3, 6-2. John Millman, Australia, def. Matt Reid, Australia, 6-1, 6-2. Dennis Novikov, San Jose, def. Matt Seeberger, Los Altos, 6-2, 6-2. Alex Bolt, Australia, def. Peter Polansky (5), Canada, 6-3, 6-2. Liam Broady, Great Britain, and Jordan Thompson, Australia, lead Julio Peralta, Chile, and Matt Seeberger, Los Altos, 7-6 (5), suspended by darkness. Tim Smyzcek (2), United States, vs. Bjorn Fratangelo, United States. Alex Kuznetsov, United States, vs. Liam Broady, Great Britain. Peter Polansky and Adil Shamasdin (1), Canada, vs. Bjorn Fratangelo and Marcos Giron, United States (not before 1:30 p.m.). Wayne Odesnik, United States, vs. Jared Donaldson, United States. Liam Broady, Great Britain, and Jordan Thompson, Australia (to finish). Denis Kudla and Michael Russell, United States, vs. Wesley Koolhof, Netherlands, and Elias Ymer, Sweden. Daniel Nguyen, United States, vs. Julian Lenz, Germany. Alex Bolt, Australia, and Frank Dancevic, Canada, vs. Sekou Bangoura and Vahid Mirzadeh (3), United States. Alex Kuznetsov, United States, and Nils Langer, Germany, vs. James Cluskey and James McGee, Ireland. in the first round of the $50,000 Napa Valley Challenger. Neither past accomplish- ments nor seedings meant much in the $50,000 Napa Valley Challenger on Monday. Robby Ginepri, the only active American man to reach a Grand Slam singles semifinal, lost to Liam Broady of Great Britain 6-4, 6-0 in the first round at the Napa Valley Country Club. Both singles seeds in action Monday also fell. No. 4 Bradley Klahn, a former Stanford star, lost to fellow American left-hander Wayne Odesnik 6-4, 6-4. And No. 7 Denis Kudla succumbed to Alex Kuznetsov 6-2, 3-6, 7-5 in another all-American matchup. Ginepri, who lost to Andre Agassi in five sets in the semis of the 2005 U.S. Open, has reached the fourth round or better at all four Grand Slam tournaments. The 31-year-old right-hander won the Tallahassee Challenger on clay in May and earned a wild card into the French Open, where he was annihilated by eventual champion Rafael Nadal 6-0, 6-3, 6-0 in the first round. Broady, a 20-year-old left-hander, won the boys doubles titles at Wimbledon in 2010 and the Australian Open in 2012. His sister, 24-year-old Naomi, gained the Wimbledon mixed doubles quarterfinals this year with countryman Neal Skupski. Both Broadys are 6-foot-2 (1.89 meters). Kuznetsov advanced to the semifinals of last year's inaugural Napa Challenger, and Kudla and Klahn reached the quarterfinals. Kudla was seeded first. This year's No. 1 seed, 54th-ranked Sam Querrey, is scheduled to play today not before 1 p.m. in the first round against qualifier Frederik Nielsen of Denmark. The 6-foot-6 (1.98-meter) Querrey, a native of nearby San Francisco, has battled injuries since climbing to a career-high No. 17 in 2011. Nielsen and Jonathan Marray of Great Britain in 2012 became the first wild cards to win the Wimbledon men's doubles title. Nielsen's grandfather, Kurt, advanced to the Wimbledon singles final in 1953 and 1955. Nils Langer (1), Germany, def. Jose (Rubin) Statham, New Zealand, 6-4, 1-6, 7-5. Julian Lenz, Germany, def. Cameron Norrie, Great Britain, 6-2, 6-1. Daniel Nguyen (3), United States, def. Alexios Halebian, United States, 3-6, 6-3, 6-0. Frederik Nielsen (6), Denmark, def. Cameron Norrie, Great Britain, 7-6 (3), 4-6, 7-5. Wayne Odesnik, United States, def. Bradley Klahn (4), United States, 6-4, 6-4. Alex Kuznetsov, United States, def. Denis Kudla (7), United States, 6-2, 3-6, 7-5. Bjorn Fratangelo, United States, def. Kyle Edmund, Great Britain, 3-6, 7-6 (6), 6-2. Liam Broady, Great Britain, def. Robby Ginepri, United States, 6-4, 6-0. Alex Bolt, Australia, and Frank Dancevic, Canada, def. Nicolas Meister and Clay Thompson, United States, 6-4, 3-6 [11-9]. Adam Hubble and John-Patrick Smith, Australia, def. Tennys Sandgren and Rhyne Williams (4), United States, 6-2, 6-3. Bradley Klahn and Tim Smyczek (2), United States, def. Matt Reid, Australia, and Jose (Rubin) Statham, New Zealand, 6-4, 6-3. Sekou Bangoura and Vahid Mirzadeh (3), United States, def. Sebastian Bader, Austria, and Erik Elliott, United States, 6-3, 1-6 [10-3]. Michael Russell (6), United States, vs. Tennys Sandgren, United States. Ryan Harrison, United States, vs. Jared Donaldson, United States. Sam Querrey (1), United States, vs. Frederik Nielsen, Denmark (not before 1 p.m.). Marcos Baghdatis (3), Cyprus, vs. Marcos Giron, United States. James McGee, Ireland, vs. Elias Ymer, Sweden. John-Patrick Smith, Australia, vs. Julian Lenz, Germany. Tim Smyczek (2), United States, vs. Nils Langer, Germany (not before 1 p.m). Matt Reid, Australia, vs. John Millman, Australia. Liam Broady, Great Britain, and Jordan Thompson, Australia, vs. Julio Peralta, Chile, and Matt Seeberger, Los Altos. Frank Dancevic (8), Canada, vs. Daniel Nguyen, United States. Rhyne Williams, United States, vs. Jordan Thompson, Australia. Dennis Novikov, San Jose, vs. Matt Seeberger, Los Altos (not before 1 p.m.). Peter Polansky (5), Canada, vs. Alex Bolt, Australia. Robby Ginepri, the only active American man to reach a Grand Slam singles semifinal, is scheduled to play Liam Broady of Great Britain today in the first round of the $50,000 Napa Valley Challenger. The match will begin not before 4:30 p.m. at the Napa Valley Country Club. Admission is $15 daily through Thursday and $20 daily from Friday through Sunday. Ginepri, who lost to Andre Agassi in five sets in the semis of the 2005 U.S. Open, has reached the fourth round or better at all four Grand Slam tournaments. The 31-year-old resident of Kennesaw, Ga., also has won three titles on the ATP World Tour, the major leagues of men's tennis. Ginepri, a right-hander, reached a career-high No. 15 in the world in 2006 but broke his left elbow in 2010 when he fell off his bicycle trying to avoid a squirrel. He is now ranked No. 213. Broady won the boys doubles titles at Wimbledon in 2010 and the Australian Open in 2012. Now 20, the left-hander is ranked No. 286. Two all-American matches will precede Ginepri vs. Broady on Center Court. Fourth-seeded Bradley Klahn will meet fellow left-hander Wayne Odesnik not before 11:30 a.m. Klahn won the 2010 NCAA title as a Stanford sophomore, and graduated in 2012 and advanced to the quarterfinals of last year's inaugural Napa Valley Challenger. After the Klahn-Odesnik encounter, seventh-seeded Denis Kudla faces a tough assignment against Alex Kuznetsov. They reached the Napa quarterfinals and semifinals, respectively, last year. Kudla was the top seed. On Sunday, a pair of 2012 Wimbledon champions played separate matches in the second round of qualifying. Sixth-seeded Frederik Nielsen, a Dane who won the men's doubles title at the All England Club with Jonathan Marray, edged wild card Clay Thompson, a 6-foot-6 (1.98-meter) UCLA All-American, 2-6, 7-5 7-6 (6). Eighth-seeded Andrew Harris, who took the Wimbledon boys doubles crown with Australian countryman Nick Kyrgios, lost to left-hander Alexios Halebian, a 20-year-old Florida native, 7-5, 6-4. Nils Langer (1), Germany, def. Kevin Kim, United States, 6-2, 5-7, 6-2. Jose (Rubin) Statham, New Zealand, def. Spencer Papa, United States, 4-6, 6-4, 6-1. Cameron Norrie, Great Britain, def. Ben McLachlan, New Zealand, 6-2, 6-2. Frederik Nielsen (6), Denmark, def. Clay Thompson, United States, 2-6, 7-5, 7-6 (6). Daniel Nguyen (3), United States, def. Dane Webb, United States, 7-5, 6-2. Alexios Halebian, United States, def. Andrew Harris (8), Australia, 7-5, 6-4. Mico Santiago, United States, def. Vahid Mirzadeh, United States, 6-3, 6-0. Julian Lenz, Germany, def. Daniel Garza (7), Mexico, 6-4, 6-2. Daniel Nguyen (3), United States,vs. Alexios Halebian, United States (final-round qualifying). Wayne Odesnik, United States, vs. Bradley Klahn (4), United States (not before 11:30 a.m.). Denis Kudla (7), United States, vs. Alex Kuznetsov, United States . Liam Broady, Great Britain, vs. Robby Ginepri, United States (not before 4:30 p.m.). Cameron Norrie, Great Britain, vs. Frederik Nielsen (6), Denmark (final-round qualifying). Bjorn Fratangelo, United States, vs. Kyle Edmund, Great Britain (not before 11:30 a.m.). Alex Bolt, Australia, and Frank Dancevic, Canada, vs. Nicolas Meister and Clay Thompson, United States (not before 1 p.m). Tennys Sandgren and Rhyne Williams (4), United States, vs. Adam Hubble and John-Patrick Smith, Australia (not before 2:30 p.m.; may move to Center Court). Matt Reid, Australia, and Jose (Rubin) Statham, New Zealand, vs. Bradley Klahn and Tim Smyczek (2), United States (not before 3:30 p.m.). Nils Langer (1), Germany, vs. Jose (Rubin) Statham, New Zealand (final-round qualifying). Mico Santiago, United States, vs. Julian Lenz, Germany (final-round qualifying). Sekou Bangoura and Vahid Mirzadeh (3), United States, vs. Sebastian Bader, Austria, and Erik Elliott, United States (not before 1:30 p.m.). Sam Querrey, ranked 52nd in the world, has accepted a wild card in the $50,000 Napa Valley Challenger. The 26-year-old native of nearby San Francisco is seeded first in the second annual tournament at the Napa Valley Country Club. The main draw is scheduled for Monday through Sept. 28. Following Querrey in the seedings are, in order, Tim Smyczek, 2006 Australian Open runner-up Marcos Baghdatis, former Stanford star Bradley Klahn, Peter Polansky, Michael Russell, Denis Kudla and Frank Dancevic. Querrey also is entered in the $100,000 Sacramento and Tiburon Challengers the following two weeks. The 6-foot-6 (1.98 meters) Querrey reached a career-high No. 17 in January 2011 but has battled injuries since then. He is coming off two singles victories in the United States' 5-0 triumph over Slovakia in the Davis Cup World Group playoffs last week in Chicago. Two of the three current or former Wimbledon champions in the Napa qualifying draw won their first-round matches on Saturday. Noah Rubin, who captured the junior boys singles title at the All England Club in July, lost to 21-year-old German Julian Lenz 6-4, 6-2. The 5-foot-9 (1.74-meter) Rubin, an 18-year-old product of the John McEnroe Tennis Academy in New York, recently began his freshman year at Wake Forest in Winston-Salem, N.C.
Sixth-seeded Frederik Nielsen, a Dane who won the 2012 Wimbledon men's doubles title with Jonathan Marray of Great Britain, dismissed wild card Victor Pham of Saratoga 6-2, 6-1. Pham has verbally committed to attend Columbia beginning next year. Eighth-seeded Andrew Harris, who took the 2012 Wimbledon boys doubles crown with fellow Australian Nick Kyrgios, routed former UC San Diego standout Erik Elliott 6-2, 6-0. Nils Langer (1), Germany, def. Nick Chappell, United States, 6-3, 6-1. Kevin Kim, United States, def. Sebastian Bader, Austria, 6-4, 6-4. Spencer Papa, United States, def. James Cluskey, Ireland, 4-6, 7-6 (4), 6-0. Jose (Rubin) Statham, New Zealand, def. Sekou Bangoura (5), United States, 6-4, 6-4. Cameron Norrie, Great Britain, def. Nicolas Meister (2), United States, 7-5, 6-2. Ben McLachlan, New Zealand, def. Chris Wettengel, United States, 6-4, 6-4. Clay Thompson, United States, def. Reilly Opelka, United States, 7-6 (8), 6-7 (8), 6-4. Frederik Nielsen (6), Denmark, def. Victor Pham, Saratoga, 6-2, 6-1. Daniel Nguyen (3), United States, def. Tommy Paul, United States, 4-6, 6-3, 6-1. Dane Webb, United States, def. Adam Hubble, Australia, 7-5, 6-3. Alexios Halebian, United States, def. Oren Motevassel, San Jose, 6-3, 6-2. Andrew Harris (8), Australia, def. Erik Elliott, United States, 6-2, 6-0. Mico Santiago, United States, def. Tigre Hank (4), Mexico, 6-0, 6-2. Vahid Mirzadeh, United States, def. Trey Strobel, United States, 6-4, 7-5. Julian Lenz, Germany, def. Noah Rubin, United States, 6-4, 6-2. Daniel Garza (7), Mexico, def. Wesley Koolhof, Netherlands, 7-5, 1-6, 6-3. Nils Langer (1), Germany, vs. Kevin Kim, United States. Julian Lenz, Germany, vs. Daniel Garza (7), Mexico. Alexios Halebian, United States, vs. Andrew Harris (8), Australia. Spencer Papa, United States, vs. Jose (Rubin) Statham, New Zealand. Cameron Norrie, Great Britain, vs. Ben McLachlan, New Zealand. Daniel Nguyen (3), United States, vs. Dane Webb, United States. Mico Santiago, United States, vs. Vahid Mirzadeh, United States. Clay Thompson, United States, vs. Frederik Nielsen (6), Denmark. It's a long way from Rapid City, S.D., to Wimbledon. Literally and even more so figuratively. South Dakota is known for Mount Rushmore, the Wounded Knee Massacre of 1890 and "Little House on the Prairie" by Laura Ingalls Wilder. --Sparky Anderson, the late Hall of Fame baseball manager. --Billy Mills, the second Native American (after Jim Thorpe) to win an Olympic gold medal. He accomplished the feat in the 10,000 meters in the 1964 Tokyo Olympics. --Adam Vinatieri, the Indianapolis Colts' placekicker in his 19th NFL season. He's the fifth-leading scorer in league history and the first kicker to play on four Super Bowl champions. --Mike Miller, a Cleveland Cavaliers swingman who won NBA titles with the Miami Heat in 2012 and 2013. --Becky Hammon, the seventh-leading scorer in WNBA history and recently named assistant coach for the San Antonio Spurs. She is the first full-time female assistant in any of the four major American sports. --Mark Ellis, a St. Louis Cardinals second baseman in his 12th major-league season. South Dakota -- with a population of only 844,877, fifth smallest in the United States, and long, harsh winters -- is to tennis what Alabama is to ice hockey. Michaela Gordon, though, negotiated the trek from Rapid City to the hallowed grounds of the All England Club. Rapid City, on the western side of South Dakota near Wyoming, is the state's second-largest city (behind bustling Sioux Falls) with a metropolitan-area population of 124,766. Gordon, 15, was born in Chicago and lived in Rapid City from age 3 to 9. She then moved to the San Francisco Bay Area, first to Los Altos Hills (near Stanford) and last year to Saratoga (near San Jose). Playing on grass for the first time in July, she reached the junior girls quarterfinals at Wimbledon. from age 3 to 9. As an amateur and the youngest player in last week's $25,000 Redding Challenger, Gordon advanced to her first quarterfinal in her sixth professional tournament. The 5-foot-8 (1.73-meter) Gordon stunned fourth-seeded Tammi Patterson, a 24-year-old Australian ranked No. 307 in the world, 6-4, 6-2 in the second round before losing to 6-foot-1 (1.85-meter) Alexandra Stevenson, 6-4, 4-6, 7-6 (3). Stevenson, the 33-year-old daughter of basketball legend Julius Erving, in 1999 became the first female qualifier to reach the Wimbledon semifinals. Gordon's performance in Redding will vault her from No. 939 in the world to about No. 594 on Monday. Among juniors 18 and under, she is No. 85 internationally and No. 17 in the United States. "I don't know how I got good at tennis, because the training (in South Dakota) wasn't that great, and I wasn't really serious about it," Gordon conceded in Redding. "South Dakota is like a really small town, and it's not known for tennis. Everyone knows everyone." Here's how Gordon became good at tennis: She's a prodigy. Robert Gordon, a surgeon who played tennis at Northwestern, introduced his daughter, the middle of five children, to tennis when she was 4. By age 8, Michaela dazzled coach Wayne Sleight at the Tennis Center of the Black Hills in Rapid City with her ability. "She's got fast hands and great footwork," Sleight said in a 2007 story in the Black Hills Pioneer. "She's also a great listener, and she's very smart. She calculates the game better than most 16-year-olds. She has all the tools to reach the top level. Most important is she loves practicing." The Gordons, however, did not move to the Bay Area to develop Michaela's game. "It was a little bit of (Robert's) job and the fact that I have a lot of family in the area," explained Michaela's mother, LuShan. Shortly after moving, Michaela won the girls 10-and-under title in the prestigious Little Mo national championships in 2009 in Austin, Texas. Andy Roddick won the boys 10 crown in 1992. Gordon doesn't dwell on her accomplishments, though. "All her trophies are put away in her closet," said LuShan, a non-practicing dentist. "She's not one to display them. It's funny. She goes to friends' houses, and they have trophies, and that's their whole life. It's interesting to me that that's not all of what defines her, even though she spends so much time on tennis.
" ... It's more, 'What's the next hurdle?' She's looking ahead a little bit. I think that's a good thing, actually." "She's a deep thinker," LuShan said. "She's a really smart kid. One of the things that helps her on the tennis court is she does think and finds out a way to defeat her opponent." Michaela, who trains at the Eagle Fustar Tennis Academy, listed aggressiveness and her serve and two-handed backhand as strengths. She added that she's "definitely very competitive." Gordon practices during the Redding Challenger. Gordon made her junior Grand Slam debut at last year's U.S. Open, dispatching Darya Kasatkina of Russia 6-4, 6-3 in the second round before falling to Louisa Chirico of Harrison, N.Y., 6-7 (2), 7-5, 6-2. Kasatkina won this year's French Open girls title, and Chirico, who turned pro in May out of high school, is the 218th-ranked woman in the world. They are two and three years older, respectively, than Gordon. Chirico also beat Gordon in the quarterfinals of the USTA Girls 18 National Championships last month in San Diego. Gordon almost didn't play at Wimbledon this year. "It was a long way to go," LuShan reasoned, "but my husband really wanted to go, so we went as a family. We said (to Michaela), 'We know you haven't played on grass a lot, but just see how you like it.' First day, she walked out there and said, 'I like grass.' "
Grass, as it turned out, suits Gordon's game. "It's really fast, the ball bounces really low, and the points are pretty short," she explained. "The more aggressive you are, the better it is for you." As a qualifier at Wimbledon, Gordon knocked off 14th-seeded Sandra Samir of Egypt in the first round before defeating Great Britain's Isabelle Wallace and Maia Lumsden. Wallace had a point to lead 5-1 on her serve in the third set, but Gordon rallied to win 6-2, 5-7, 8-6. "It was funny because at 6-all (in the third set), I forgot that you have to win by two games," Gordon said with a chuckle. "I thought it was a tiebreaker, so after I won the first point, I thought I was still serving. "It was a really good win because the whole crowd was for her the whole time. It was good for me to have that knowledge that I can still win when everyone is against me." On one hand, Gordon sounds like a typical teenager, sprinkling her speech with "like," "definitely" and "random." On the other hand, she sounds mature for her age, using the words "procrastinate" and "interact." A high school sophomore, Gordon has studied independently since the eighth grade. "I do Laurel Springs, which is a, like, private online program," said Gordon, who also decided to resume playing the piano a year ago as a hobby. "It's pretty good because I have the same textbooks that I would have in regular school. But it's difficult because it's easy to procrastinate, so it's really important to be self-motivated and do your work every day." "I miss my teachers, and I miss my friends," she lamented. "I miss having someone there to teach you and talk to you. Now, I don't have teachers I can interact with." Gordon prefers this lifestyle, though. "Definitely," she asserted. "Being able to play tennis and travel the world is definitely worth it."